Family literacy involves the literate activities families engage in at home and in the larger community. These interactive routines might include reading and writing together, playing an educational video game, or simply talking to infants and responding to the sounds they make. In January 2010, ALA and then President Dr. Camila Alire initiated the Family Literacy Focus to promote family literacy across diverse communities. Día , an initiative of ALSC, the Association for Library Service to Children, highlights the importance of literacy for all children, from all backgrounds, and of linking children and their families to diverse books, languages and cultures. 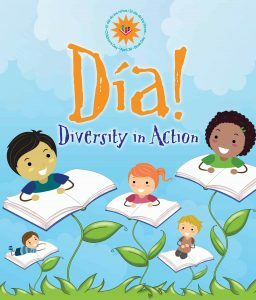 To mark the 20th Anniversary of Día in April, 2016, ALSC updated the National Día Program Registry, making it searchable by location and language; libraries, schools, and community organizations can enter programs aimed at celebrating diversity and literacy. ALSC also offers free Día resources for download. The Black Caucus of the American Library Association’s Reading is Grand!